(CNN) - California Gov. Jerry Brown's in the driver's seat as he campaigns this year for an unprecedented fourth term steering the Golden State, according to a new survey. 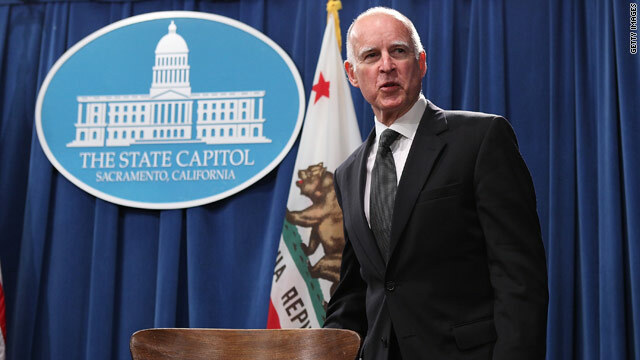 A Field Poll released Wednesday indicates that Brown leads GOP challenger Neel Kashkari 52%-32% among California voters likely to cast ballots in the November general election. Sixteen percent of likely votes were undecided. Kashkari, a former Bush administration treasury official, beat out GOP state Rep. Tim Donnelly for second place earlier this month in California's gubernatorial primary. The Golden State holds "open" or "jungle" primaries, in which all candidates compete in a single contest and the first and second place finishers, regardless of party affiliation, advance to the general election. The 76-year old Brown was first elected California governor in 1974 and re-elected in 1978. He also served as Oakland mayor from 1998-2006, California Attorney General from 2006-2010, and was elected governor again four years ago. He also made bids for the Democratic presidential nomination in 1976, 1980 and 1992, but earlier this year ruled out a fourth run for the White House in 2016. The Field Poll indicates that Brown tops Kashkari 82%-7% among Democrats and has a 49%-25% lead among independents, with Kashkari favored 71%-13% among Republicans. The survey also indicates that 54% of California voters approve of the job Brown's doing as governor, with 29% giving him a thumbs down. The Field poll was conducted June 5-22, with 1,382 registered voters in the Golden State questioned by telephone. The survey's sampling error is plus or minus 2.7 percentage points. CNN Political Editor Paul Steinhauser contributed to this story. Have things gotten better in Cali ??? then vote ineptness out. To all the libs who think it should be open border, open your house and checkbook to all who want in if you fell that strong about. Just don't expect people who don't to pay for it, in other words put up or shut up !!! California has a budget surplus, folks. Anyone who thinks CA is heading for destruction needs to wake up. California is running a surplus, which Democrats have been putting aside as a rainy day fund for emergencies, or another major economic downturn. The cash pile is driving conservatives crazy because they want to spend it in the form of a tax cut. Yikes! the lies from the lefties just come fast & furious in here.... Now the facts as reported by the NYT. Nice try liars! Thanks for pointing that out. California wouldn't be in a position to be able to pay down Gov Arnold "I'll be Bach." Schwarzenengger's debts if they were NOT running a surplus. @Salty, I have no dog in this fight (pun intended), but any honest discussion about a state's financial status must include unfunded liabilities. To kick the can down the road, as has all too often been the case from city level (Detroit comes to mind), to state level, to national level, is disingenuous and irresponsible. Neither party has a corner on that market, so while it's fun to bash back and forth across the aisle, it doesn't address the problem of unfunded obligations. Things have been MUCH Better in California since the Democrats have taken over. We have a great surplus and the schools are getting better funding and more people are getting healthier. Thanks for Asking! Smitty, CA is doing just fine and is running a budget surplus. You live in CA and dont like it, Leave!!! I don't need to "saved from myself". This is the whole trouble with the self-righteous Theocracy movement. I choose freedom instead. No, the reality is you want all of the freedom but none of the responsibility for the consequences OR the financial costs. Don't expect others to help you and certainly not pay for your insanity now or in the future, when your take, take, take mentality drains the well. But no thanks for pointing out your lie of Republicans wanting to spend the surplus on tax cuts when in reality the Democrats wanted to spend it on increased spending??? Come on Rudy, when you are caught blatantly lyng like that, you should have the decency to apologize to all the people you mislead. Apparently, the ability to pay back debts is viewed as a bad thing by the Right. However, these are also the people who have perpetuated the myth that tax cuts pay for themselves. Now, has anyone seen a case where cutting a revenue stream has ever allowed anyone to pay for it without changing a thing? Funny how the Right seems to never want to admit that to themselves, but howls like a pack of wolves when someone else decides to pay off the debts they have racked up. "...you want ... none of the responsibility for the ... financial costs." Curious statement coming from someone who thinks that they pay too much in taxes. What California needs is a real leader like Rick Perry to turn things around and make things worse ! California will continue to slide. We appreciate the employers you are sending to our state. I understand the Uhaul businesses are racking it in there from all the people leaving the state. Illegals can fill the void. Of course he has a huge lead the budget is balanced for the first time in over a decade we're paying down the states debt as opposed to expanding it, refunding of state services like education instead of defunding them and all while amidst an economic recovery you really can't ask for better leadership of a difficult to manage state. Couple that with the abject failure of the previous GOP governors what do they have to campaign against and with? The California GOP have consistently proven again and again that they have nothing to offer California but misery. I will thank you not to "save me" OR lecture me on consequences. I travel outside the US and still get snide comments about the Bush fiasco in Iraq, and the deaths of 100,000 people in the world invading the wrong country. At least Putin is goal directed and knows where he is going when he is on conquest. And the US is deeper in debt as well. I wonder if the Tea Party folks are considering consequences when they tell people it is OK to take arms to overthrow my country. Las Vegas again? Are good friends with Bobby Jindal , you must be . Brown is one of the very Few politicians in the country that knows what he is doing, just look at the record. And in other news: The Arab Spring in the Middle East touted as a huge success by this administration continues to blossom..... Oh wait! The prevailing " wisdom" among conservatives has always been that we are taxed too much, and that we need to have more personal responsibility. Yet, who is assuming responsibility for the mess that decades of GOP governors created? Jerry Brown, the man derided as " Governor Moonbeam", seems to have a far greater understanding of personal and collective responsibility than the whole GOP. Perhaps their "wisdom" is nothing more than the wishful thinking of those who simply don't want to help anyone but themselves, and who have had the opportunity to put their childish, Ayn Rand inspires fantasies into effect with disasterous results. Liberals understand that if the society wants services, they need to be paid for. Its only the conservatives who engage in this idiotic display of alternately screaming for tax cuts and decrying personal responsibility while attaching a fee onto everything that moves, a la Mitt Romney. Really? Why? I don't mind paying my fair share of taxes for the services I use, etc. But I do object to paying for 10-20 others who pay nothing and live off of the myriad of government freebies most of my tax money gets taken to fund. And those 10-20 people get 10-20 votes to put somebody in office that promises to take more from me and my family in order to give to them. Welcome to the Democrat Union Crime Syndicate. The old way was a strong arm shakedown. The new way is to have the government do the dirty work and sick the IRS on you. @Rudy-Being in debt is not what would I call doing fine. This is the exact reason so many people are struggling out there, they run up massive debt and try and blank it out of their minds. At least Putin is goal directed and knows where he is going when he is on conquest. didn't realize you lefties admired putin so much. your buddy obama is the one that empowers him since he exudes weakness at every opportunity. he must look at it as helping a fellow communist. putin can hardly wait for another knee slapping mement and some more of that obama flexibility/fectlessness. Brown could learn a thing or two from the likes of Christie, and rick Perry, use funds specifically allocated for one thing and use it to give tax breaks to the wealthiest, when your broke, rob pensions, then tout your states fiscal responsibility. Wake up you retards,its sop for the gop, and of course, blame it on the Democrats in the state, takes a certain kind to keep drinking that BS. I would agree if the money going to those services were ran efficiently and effectively without so much rampant waste. Those "services" would cost half if that were the case leading to less taxes to pay for it. That was hyperbole and as a result you completely missed the point. But let's take more subjects and critical thinking out of schools and become the idiot children of the world.